Expressions of interest are being sought for a club who would like to host the Irish Cross-country Mountain Bike Marathon (XCM) Championships 2019. There is no set date for this event. The event was not run in 2018. Expressions of interest are being sought from clubs who would like to host a round of the Irish Cross-country MTB National Point Series (NPS) in 2019. The aim is to have five rounds. The Cycling Ireland Off-road Commission is seeking expressions of interest from clubs to run the Enduro National Championships for 2019. There is no set date for this event. secretary@offroadcyclingireland.ie. Closing date of applications is close of play Tuesday 20 November 2018. This is the third notification of Cycling Ireland Off-road Commission Annual General Meeting (AGM). Details of the nominations and motions are shown below. The meeting will take place on Saturday 20 October 2018 – Carlton Hotel Dublin Airport. Meet at 11:45 with start time at 12:00. Tea and coffee will be available at the break, however, there is no lunch scheduled so make sure you eat before you arrive. This is the second notification of Cycling Ireland Off-road Commission Annual General Meeting (AGM). This meeting will take place on Saturday 20 October 2018 – Carlton Hotel Dublin Airport. Meet at 11:45 with start time at 12:00. Tea and coffee will be available at the break, however, there is no lunch scheduled so make sure you eat before you arrive. NOTE: The deadline for submissions of nominations and proposals has been extended to Wednesday 17 October 2018. Sunday 7 October 2018 is now an important date in the history of Irish Cyclo-cross as this was when the first UCI C2 race took place. The idea came from a discussion between event organiser Glenn Kinning and Andy Layhe (the cyclo-cross representative on the Cycling Ireland Off-road Commission), when returning from the World Cyclo-cross Championships at the start of 2018. The Enduro World Series (EWS) at Aínsa, Spain was a tough two days battling with temperatures as high as 35C! I had a bit of trouble keeping pressure in my rear wheel on Day 1 but I trucked on and got it patched up for the final two stages of the day. I headed into Day 2 with the ambition of taking a stage win and that I did. I was happy to finish up in P2 after a challenging two days. This is the first notification of Cycling Ireland Off-road Commission Annual General Meeting (AGM). This meeting will take place on Saturday 20 October 2018 – venue to be confirmed (Dublin based). The commission will be made up with the following 9 positions. All of the posts are up for re-election. The commission wish to highight that current Chair, Damien Duggan, has come to the end of his 2 years in the position. Also note that the Downhill Co-ordinator, Derek Cowan, has expressed his desire to step down from the Commission. The Commission did not have a cross-country rep in 2018. The Irish Off-road team headed to Lenzerheide in Switzerland to compete in the World Championships of both downhill and cross-country. Both courses proved very tough. With big crowds and super atmosphere this was truly a big occasion for the team. 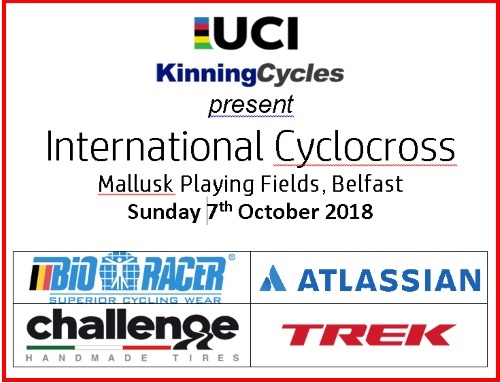 The world’s leading cyclocross tyre manufacturer is the latest company to show its support and backing for the International UCI Cyclocross promoted by Kinning Cycles, taking place in Belfast on Sunday 7th October 2018. Challenge Tires join forces with Bioracer and Atlassian as the main sponsors for the event.